The RMG Scorpion (also called Sorcerer in overseas markets) and Poltergeist models are manufactured by Halco Tackle. The Scorpion is an ultimate cast and retrieve lure with unique tight action and body roll that will mesmerise many species of sports fish. This highly durable lure features a light rattle and clear bib with Halco’s bulletproof bib securing system for added strength when clearing snags. The Poltergeist has a unique body shape, ideal for clearing snags. It is a crash diver range of cast and retrieve lures, sporting a unique shuffling action. 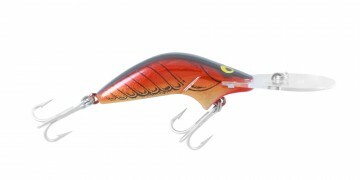 The lure features a light rattle, and is ideal for both fresh and salt water species. The Halco Bulletproof Bib securing system ensures added strength when clearing snags.